Stretching your IT band is the best way to prevent Iliotibial band friction syndrome (ITBS). This condition causes hip pain or knee pain and while it tends to be a common running injury, but it can also occur in non-runners. 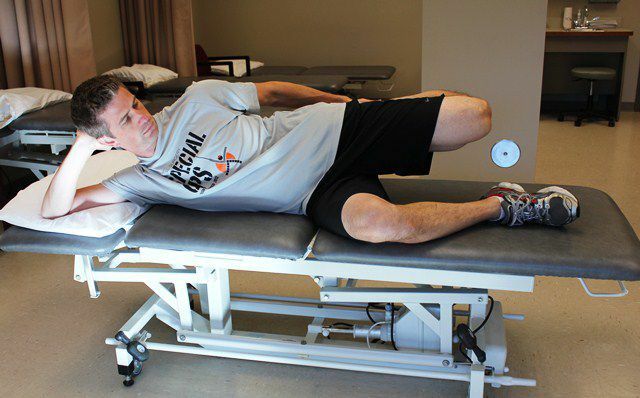 Often ITBS requires physical therapy to help decrease pain, improve range of motion around the hip and knee, and strengthen the hip muscles and muscles around the knee. One of the challenging things about ITBS is that it can be difficult to stretch the iliotibial band. The thick band of tissue courses from your lateral hip to your knee, and knowing which stretch to do, and when to do it, is part of the battle of treating the condition. Some people benefit from the standing ITB stretch, but many patients have a difficult time feeling that stretch. The standing ITB stretch also focuses on the hip portion of the iliotibial band, and it may not quite get to the knee portion of the structure. So is there a better way to stretch your ITB? There is. The sidelying iliotibial band stretch is the perfect exercise to stretch the knee aspect of your ITB. Many times, tightness in a structure called the iliotibial (IT) band can be one cause of ITBS. The iliotibial band is a thick band of tissue that extends from the side of your hip to your knee. As the iliotibial band crosses the outside, or lateral, part of your knee, it may rub abnormally, causing pain. Sometimes, tightness in the iliotibial band causes hip pain. More frequently, iliotibial band tightness causes lateral knee pain, which usually feels like a sharp, burning sensation on the outside part of your kneecap (patella). Tightness here can also cause your kneecap to move out of position, causing patellofemoral stress syndrome or patella subluxations. Iliotibial band friction syndrome may limit your ability to run. In severe cases, you may also feel sharp knee pain when rising from sitting or with walking. Sometimes walking up and down stairs becomes a problem if you have ITBS. If you have lateral knee pain or hip pain, you should consult with your doctor or physical therapist to determine if it is ITBS. Your physical therapist can assess your situation and prescribe exercises to help improve your strength and flexibility in your iliotibial band. Start by lying on one side. The side that you wish to stretch should be on top. Keep your bottom knee bent for stability, then reach back and grab the ankle of your upper leg and bend your knee. You should feel tightness in the front of your thigh (the quadriceps muscle). While holding your upper knee bent, gently rest the foot of your bottom leg on top of your upper knee. Use your foot on top of your knee to slowly pull your upper knee down towards the floor. You should feel a pulling sensation on the side of your kneecap where the iliotibial band crosses the knee joint. Hold this position for 30-60 seconds, and then relax. Repeat this stretch three to five times. This stretch can be done two to three times per day, and it may be incorporated as part of a warm-up routine before athletic activity. Of course, if you have any questions or are feeling increased pain with this stretch, contact your physical therapist for more one-on-one instruction and care for your ITBS. Another way to stretch the iliotibial band is the standing ITB stretch, which done standing against a wall, and is more directed at the iliotibial band as it crosses the hip. Iliotibial band friction syndrome can cause knee pain and hip pain, and it can limit your ability to walk, run, and enjoy normal recreational activity. The sidelying iliotibial band stretch is one exercise that you can do to help improve your flexibility to help you quickly get back to normal function. Baker, R. L., Souza, R. B., Rauh, M. J., Fredericson, M., & Rosenthal, M. D. (2018). Differences in knee and hip adduction and hip muscle activation in runners with and without iliotibial band syndrome. PM&R. Is Your IT Band Causing That Pain On the Outside of Your Knee? What Exactly Are the Quad Muscles? Where Are Your Glutes and Why Are They So Important?